This post is sponsored by HP Instant Ink. All opinions are mine. I love to come up with fun ideas that help us capture our memories and showcase them in creative and crafty ways. This summer we are filling our days with a lot of fun adventures and I have been taking a lot of photos and posting them on social media. Since my kids aren't on social media, sometimes they don't actually see my pictures!! I am trying to change that. 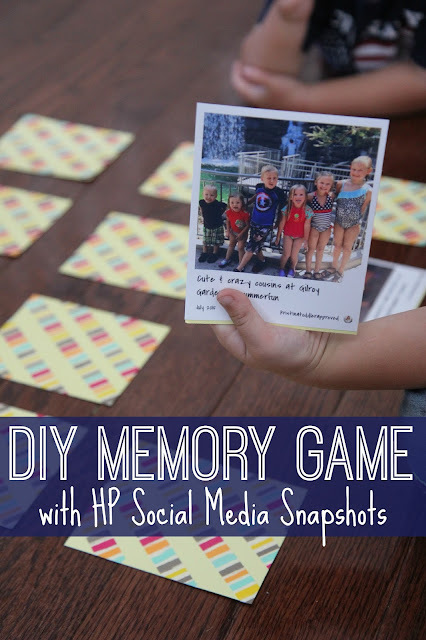 This summer I am excited to be partnering with HP to show you how I made a DIY Memory Game for my kiddos using a super cool new product called HP Social Media Snapshots along with the HP Instant Ink service. One of the best ways to get kids learning new vocabulary and building their language skills is through the use of photos. 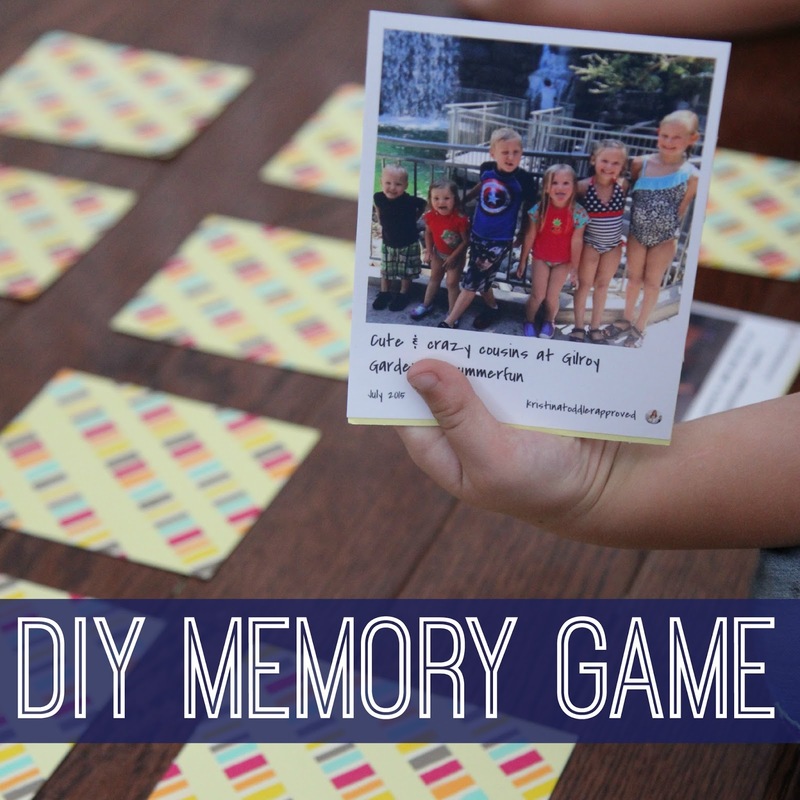 This simple memory game gets kids talking about events that have happened and even includes some text on the cards with simple info about each photo. I am terrible at getting photos put up on my walls but my phone is full of photos that document the exciting and more mundane parts of our days. One of my goals this summer is to actually print out more photos!! HP gave me an awesome new printer a few months ago and introduced me to HP Instant Ink. HP Instant Ink is an ink replacement service designed to help save you up to 50% on ink while ensuring that you never run out of ink when you need it most. I absolutely hate ordering photos on websites and driving places to pick them up or waiting for them to arrive by mail, but I LOVE printing them out at home! I almost always have photo paper, but I am always running out of ink because I print so much for movement activities, toddler book club, and church. Now that I am signed up for HP Instant Ink I will never run out of ink! Considering the majority of my ideas come to me last minute late at night it is such a relief to know that I won't be out of ink when I decide to print something at 1 AM the night before a big event. Have you ever made a DIY Memory game for your kids? This project required very little materials and was pretty simple to pull together. The kids have played with it again and again solely because they love seeing themselves and their fun summer memories represented in the game!! 1. 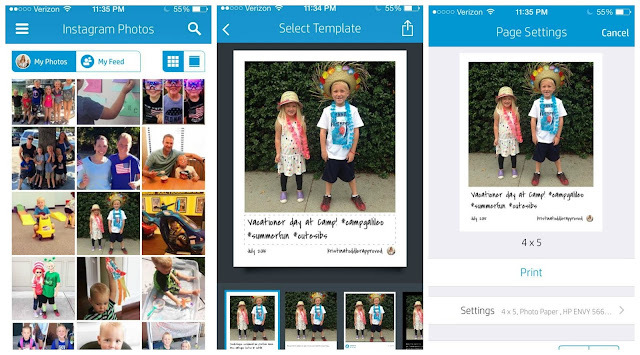 Start by printing out all of the photos that you want to use. Make sure that each photo is printed out twice so that each photo has a match. I printed our photos onto HP Social Media Snapshots removable sticky photo paper. The paper was size 4x5 inches and seriously awesome. All I had to do was download the free HP Snapshots App and then I could select photos from Instagram, Flickr, my camera, or Facebook, edit or add some text, press PRINT using my phone and they were sent directly to my printer. AMAZING! 2. Cut your cardstock paper to fit the photos. I cut my cardstock to 4x5 inches. 3. Peel the sticky back off your HP Social Media Snapshots photo paper and adhere the photo to the cardstock (sticky side down). If you don't have HP Social Media Snapshots photo paper then just use a glue stick or double-sided tape to stick the photos on the paper. 4. Add some embellishments to the backs of your memory cards. We used washi tape to add some designs to the back of our memory cards. We tried to be consistent and make the design the same on every card. 5. Mix the cards up, turn them over, and start playing!! To play our memory game you turn all cards photo down and place them in lines. Each player turns over two cards when it is their turn. The goal is the collect matches of each photo card. Once one player goes, the next player goes, and so on. If a player finds a match then they get to keep the match. If they don't turn over a match then they return the cards back to where they were. The player with the most matches by the end of the game wins. My almost 3-year-old had a blast playing with my 4 and 7-year-old. If the kids couldn't remember when a specific photo was taken my 7-year-old would read the description to the kids. I loved how we snuck some reading into this activity in such a simple and fun way! The HP Social Media Snapshots paper came in the perfect box to use to store our game as well! We stuck all of our memory cards inside and brought our game with us on vacation to play with Grandma and Grandpa! Along with this DIY Memory Game we are really excited to be sharing the HP Instant Ink program with you. So often while printing a project I discover that our ink is changing color when running low. It is so frustrating... especially on a day when the kids are really excited about a project or we have something special we need to print. The HP Instant Ink replacement service works with many eligible HP printers and saves you money on ink. It also is a great idea for busy parents who don't have time run to the store every time the ink is out. The low monthly fee starts at only $2.99. Sign up is quick and super easy once you have your printer connected and registered and you can change or cancel your plan anytime online. You can find out more about the HP Instant Ink program HERE. Right now you can get 3 months of FREE ink, when you purchase an eligible printer and sign up online for HP Instant Ink. Do you ever run out of ink at the worst time? 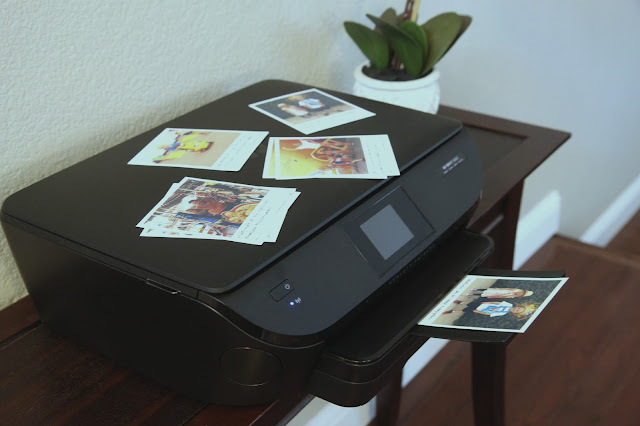 Have you made any fun crafts or activities using your printer? Come stop by our Facebook page for more creative activity ideas to try this summer. I'd love you to share your favorites as well! Disclosure: This is a sponsored post in partnership with HP Instant Ink. All opinions are mine. This is such a fun way to capture the memories!